The question might suggest that your mother doesn't wear perfume now, but I don't mean it to. I mean — what perfume did she wear when you were little and she was the most important woman in your life? I talk a lot about my mother and her perfume choices, but that's because my mother was — and is — a woman who loves perfume. It is part and parcel of the feminine things I associate her with — makeup, heels, fragrance. And it definitely influenced me. I wrote about a friend's desire to smell Fleeting Moment again because her mother, who'd passed away when she was eight, had left behind a tiny, empty bottle whose residue was still fragrant. It was one of the few, tangible things she had of hers. At the time, I thought it was wonderfully eccentric that a straight man would unselfconsciously wear a woman's perfume — his mother's perfume! It somehow made him seem even more masculine, in a strange way, because it seemed so daring. It became (perversely enough), the scent I associated with him, and I know if I ran into it again, I would immediately think of him (and I guess, unwittingly, his mother). Now, what Freud would have to say about that tangled mess, I'll leave to the experts. In any case, I am curious what your associations are with your mother's perfume. I find myself, like the old boyfriend, wanting to wear the perfumes my mother wore. Do you remember what perfume your mother wore? Are you going to get her perfume for Mother's Day, coming up on May 8th? What do you think she'd like now? They are all so beautiful, just as she was, and I can't wear them, except for Fidji. Fidji I purloined in my late teens (back when it was still Great, Good and Gorgeous), and I wore it happily for many years, for the happiness it gave me and the memories it evoked. I wish I still had some vintage, just for that alone. Tarleisio, thanks for the beautiful response. It's no surprise you have a terminal case of perfumania if your mother had exquisite taste like that! How wonderful that she took you to Paris at 14 — to the Guerlain counter no less! — and I can't believe that at that age you had the sophistication to appreciate Jicky. Your mother sounds like she was an amazing woman, and to have the foresight to choose the perfume she was going to be buried with? That is true love. As per our previous convo, my mother wore Emeraude, Wind Song, Jontue and Alyssa Ashley Musk when I was a young child. These perfumes were usually Christmas gifts from my Father. He was forbidden to buy her appliances and sleepwear that looked "cozy" so perfume was a smart choice. When I was a teenager, she wore Shalimar, Ruffles, and I know I said Fidji before, but she said she does not remember having Fidji! I have a mini bottle, and I'll get her to smell it. Perhaps having a good sniff will jog her memory. Last night I smelled Replique for the first time, thanks to a lovely perfumista who sent me a sample. Every whiff of it smelled of the someone from my past. I don't think my mother wore it, so perhaps one of my many aunts. If I was closer with my relatives, I would like to do a sort of "perfume family tree". I would love to know who wore what, and if daughters and sons ended up wearing the same/similar scents, or if they rebelled. I don't care for the perfume she's been wearing over the past 15-20 years, Perry Ellis 360 and Ralph Lauren Romance. Last Fall, she smelled Soivohle Violets and Rainwater on me and loved it, so she wears that now. Lovely post! Perfume is my earliest memory of my mother and my dear aunt who was like a mother to me. My mother wore Shalimar and Replique, then later Chanel 22, Nahema and Oscar de la Renta. She hasn't worn perfume in many years and had a disastrous experience with reformulated Replique. I recently got a vintage 1970 Shalimar edc for her- she opened the bottle, put some on and nearly wept. She said she felt like she'd been transported back in time. She is enjoying it immensely. I remember playing on her dresser and that Guerlain Montre bottle with the conical cap. My aunt wore MANY perfumes, and her whole house smelled like the ground floor of a department store. Femme was one of her favourites. She also wore Arpege, Coriandre, Lumiere, and when the big 80s perfumes came along she was in heaven. Giorgio was her favourite but she wore Poison too. She bought me l'Air du Temps, and always got me the body products, telling me that perfumed baths and powder were the ultimate luxury. I recall shopping with her once & she stopped at the Dior counter to buy Diorissimo. I knew she never wore that and asked her why she was buying it. "Why to spray on my lightbulbs of course!" I wish my mother was still here to experience all of this with me. I didn't realize it until recently, but she was a perfume fan too. There were always lots of samples and small bottles around -- I remember Madame Rochas, Flora Danica (oh how I wish I had that now!) solid perfumes from Max Factor in unbelievably ugly compacts, and getting Avon's Charisma as a gift one Christmas. In the Sixties, she wore Arpege and Moment Supreme, both of which I still have, and Woodhue cologne, which was a signature scent for her. Later, in the Seventies, she wore Charlie and Moon Drops. It was part of getting dressed for her. She was always what we called "bandbox" -- not a thread hanging, or a chipped nail or unwashed hair, ever. I used to scoff at that when I was younger, but appreciate it now. I don't know if my mother had a signature scent. She died when I was 8, and I do remember her smell in some way, but was too young to know what was her and what was perfume. As an adult, I was given a purse of her things, including a tiny, empty sample bottle of Fleeting Moment by Balenciaga. On some visceral level, the trace smell emanating from the bottle reminded me of her and the era in which I knew her (the 70s), and it really drove home to me how much memory, especially purely emotional and bodily memory, is wrapped up with these scents. And I will never forget when my dear, best friend, a vintage perfume enthusiast to whom I had told all this, tracked down some Fleeting Moment for me, so that I could smell more than an empty bottle. Now the scent evokes friendship, warmth, and presence for me as well as the more difficult feelings associated with my mother, and shows me how much power these strange smells have as they float in and out of our lives. Thank you for this lovely blog that reminds us of that. Arpege & Ecusson. I still have some Ecusson and treasure it. My mom wore one thing, and one thing only, and lots of it: Jean Nate. I adored it then, but not so much now, since the formula seems to have been trimmed to the point of poverty. PS SAVE THE SCHERRER. The thought of it heading into the garbage can gives me the cold chills. I know my late mom wore Evening in Paris when I was a kid, and some Avon fragrances over the years. However, the one I think was her favorite and that I associate with her is Coty's L'Origan. She also wore Coty's Airspun face powder, which is scented like L'Origan. My mother wore Youth Dew and Paloma Picasso. She smelled great. However, those two are just terrible on me. It's not that I don't like big fragrances, I do and wear many (as a child of the 80s), but her skin made those fragrances magical. I know that my mum wore Youth Dew, Oscar de la Renta and White Linen when she was going out. For every day scent, she used the tiny inexpensive rectangular bottles of Pagan by Lentheric, which were little dab-on jobs. All of her chosen scents smelled terrific on her and I think of them still as her scents. My Mother wore Gloria Vanderbilt. wonder if there’s a genetic predisposition toward liking certain scents? First off, I love a woman who is spraying her light bulbs with Diorissimo! That’s like feeding Beluga caviar to your cats! Pretty decadent. When I was a teen, I too, smelled like the ground floor of a department store. I know very well about the lovely Fleeting Moment. ;-) It was wonderful to be able to find it for you. XOXO. I’d love to try Ecusson! I remember the 70s Jean Naté, but I guess it’s much older. I’d love to try the older JN because I remember liking the 70s version. And yes, you should have seen the look on my face when my mother even suggested that this perfume I’d been looking for, she had all along and had thought of tossing. SHIVERS. I dabbled with Femme but like you, that’s one I consider my mother’s (old) scent, and it seems like hers so I don’t really wear it. I was into Tatiana by DVF but I want to revisit Gloria Vanderbilt! My mother smelled Cristalle without wearing it. She used to smoke; always slightly tired and unapproachable but still comforting and warm. Today, when I need a hint of the mother I smell Cristalle. The earliest fragrance I can recall Mom wearing is Estee by Estee Lauder. I think she also wore Knowing at one point. Later on she wore Eternity, Allure and Tresor. She seems to have veered away from perfumes as of late; the only scent she wears now is White Musk from The Body Shop. My grandmother always wore Blue Grass; smelling it always reminds me of her. What an amazing range of answers! My mother wore Yardley's April Violets all her life, but with a strange excursion into Youth Dew. I think she emptied two bottles of YD bath oil. A perfume more different to AV could not be imagined. She was deeply disappointed in the 1980s when Yardley replaced their dab on bottles with spays. Mum hated sprays, and she also thought the fragrance had changed. I suggested that the perfume could be the same but being atomised might change its character. She did not believe me, and she wrote to the company and complained (most unlike her). They sent her a whole bunch of freebies, but swore the formula had not changed. Looking back I think we were both right. Spraying is different from dabbing, but at the same time, Yardley is one of those brands that has been bought and sold countless times, and from what Mum said, April Violets cost less and less for her to buy. So they were probably cheapening it as they went. This is why she started using Youth Dew bath oil. You could dab it. She abandoned it after a while, and went back to (sprays) of AV. I still have the bottle she had with her in hospital when she died. The nurses loved it apparently! I also wear YD, but only use it in the bath, as a bath oil (fancy!). I can't wear Aoril Violets at all. However, a perfumista friend recently sent me a sample of Guerlain's Apres L'Ondee, and I love that as violet blend. It has all the supreme elegance of AV without being a soliflore, and it is something I could wear in my mother's memory. It is very fleeting tho' - needs to be sprayed! So in next summer I'm going to get a larger amount. Might even go a full bottle! Thanks for a great post. Have you seen that other Arpege ad: 'Don't cry Mommy! I'm sure Daddy will give you arpege!'. Nauseating ... ! You all have such glamorous mothers! My mother was never much into perfume. My grandmother was. She wore Joy and anything freesia-scented. My aunt died before I was born, but I hear she was beautiful. She had a big bottle of Shalimar parfum. It's funny, because my mother definitely contributed to my love of perfume, even though she didn't wear perfume very often. She HAD perfume--at least 15 or 20 bottles--but saved it for "special occasions". Some of my earliest memories are of sniffing the magical aromas of those bottles. I can remember no. 5, Arpege, Blue Grass, L'Origan, Tabu, D'Orsay Divine, Roger & Gallet Blue Carnation, and Avon Topaze. My favorite was the Blue Carnation, and trying to find it again has been one of my biggest frustrations. I have snagged two bottles of EdT and a jar of perfumed powder (not dusting powder--more like a dry perfume). The powder is lovely and smells very much the way I remember, but the two bottles of EdT both seem too clovey and not floral enough. I suspect they have gone off. It can't be a reformulation issue, as R&G discontinued it long ago (in the 70's, I believe). In her book "Perfume: the Art and Science of Scent" (National Geographic Society, 1998), Cathy Newman puts forth the theory that we get our perfume preferences from our grandmothers, not our mothers. I believe this may very well be true, because my grandmother (my father's mother) not only had perfume but wore it regularly, and my tastes seem to be very similar to hers. I don't remember her mentioning it to me, and I never asked her what she wore, but she always smelled really good. After my grandparents died, I went with my parents to help clear out their house. I don't know all the things my grandmother had, as others had been there before us and my grandmother's things were picked over, but I did find nearly empty bottles of Shalimar extrait and Mitsouko EdC, as well as a half-full bottle of Arpege extrait. I love Arpege and Shalimar, and I liked pre-reformulation Mitsouko. The real "ghost in the bottle" experience for me, though, came the first time I smelled Vol de Nuit at the Guerlain counter. I had an immediate and vivid recollection of my grandmother. I suspect that she must have owned and worn VdN, and that its absence from her personal belonings indicates simiply that she either had used it up (and hadn't replaced it) before she died, or else someone else got to it before me. 50_Roses, Thanks to you, I'm now on the hunt for Blue Carnation! And I discovered, per your recommendation, another perfume book! (I ordered it as soon as I read your comment, in part because I need to understand the author's theory that scent preference is passed down from grandmothers. Personality-wise, I'm much more like my grandmother than I am like my mother.) Thanks for your walk through the scents of your mother and grandmother! I hope I haven't misled you. The grandmother theory is only discussed briefly in chapter 2 "Memory and Desire". The book is wonderful, however, and I think should be in every perfumista's library. 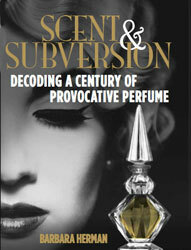 The author goes through a multitude of aspects of the history, production, and marketing of perfume. She observes the harvesting and processing of jasmine in France, attends a condensed perfumery school course in Grasse, has a perfume comissioned for her, talks about the search for new perfumery materials in the South American rainforests, and so on. And of course, since it is National Geographic, there are lots of gorgeous photographs. Thanks 50_Roses, I've just ordered a copy of the Newman book too. My Mom's signature scent changed every few years, and after I was old enough to actually contribute more than just an opinion when Dad would take me on a gift buying exhibition, it seemed to depend on what I could afford. She was a practical lady who would only rarely spend money on herself, so looking back on the scents on her dresser is also like a record of my lifetime of financial and career success (or often lack of it). The first scent of my memory was Tigress with Tabu following, Windsong, and way too much Avon. By the end I was able to afford better, and proudly upgraded those last holiday offerings to Estee Lauder, but never Youth Dew, which was too "old" for her in her opinion (and she was in her 80's when she passed.) It was quite the proud day I could actually walk into Sax Fifth Avenue and purchase an Estee Lauder gift set, AND get free wrapping! Those gifts HAD to include a matching hand lotion or powder, which she would typically use up first. First thing in the morning was fragrance, lipstick, and maybe a bit of face powder, and she was ready to take on the world. One of the almost impossible to find scents I remember from those gifts was named Hot Cargo, which was from a makeup line called Fashion 220 that my Godmother sold. The whole world of vintage "nitch" and local market products seems like its own long lost universe. When Mom wore fragrance, which wasn't often, she dabbed on some Coty Muguet des Bois cologne or an ancient patchouli oil. Mom's the original tomboy, has never had any interest in typically feminine ablutions, and would rather be changing the tire on a tractor than baking a cake. If I had to say what smell(s) reminded me most of Mom, it would be Lava soap and Prell shampoo. All of my interest in perfume came from my paternal grandmother, who always had a spray of something -Wind Song, Enjoli, Charile, Sophia, Bill Blass, or White Shoulders-on the front of her blouse. Nancy, thanks for sharing this. I love to hear about the moms who really weren't that into fragrance, or were practical as you describe your mom, but who had it anyway. And as for putting on her fragrance, lipstick and face powder and then being ready to take on the world, I just saw an amazing documentary on the New York Times street fashion photographer (Bill Cunningham), and he says that getting dressed is like putting on armor. I think it's even more the case for women. Moongrrl: Prell! My, my, I haven't thought of that in a while. I LOVED the way Prell looked in that tube as a kid.Very cute that even though your mom was a tomboy, she wore Muguet des Bois. That's pretty girly — and the opposite of patchouli! My mother could not afford perfume as such . She wore Yardley's Lavender ,I don't like the smell much as her natural one of cooking, cats and yarn was what I remember. I , on the other hand, will be remembered for hardly ever wearing the same one .My daughter says I smell all Mumsy so Une Rose is stranger than I thought ! At the moment I am besotted with Keiko Mercheri's Damasenca . Angie, I would prefer the scent of "cooking, cats and yarn too!" It sounds charming. Thanks for the reminder that although we perfume-lovers say that perfume is an essential item, it is out of reach financially for some women. (This is why I wish there were more quality Enjolis and Charlies out today.) I love that you don't have a signature scent so much as a signature note. Besides Une Rose, which rose perfumes would you take to a desert island with you? Oh my goodness , let me see as I load the trunk. There would have to be Vol de Nuit , Apres L'ondee , Scandal , Dia ,Chanel no 22 , Aimez Moi, Une Rose , Nahema . I'd like my desert island to mean deserted as in a Scottish highlands one that was cold. I'd need shelter in a cave and to be able to catch fish but most scents I love suit colder weather . This post has touched a nerve, Barbara! I have loved reading all the comments. MY mother wore Chanel No. 5. That was her dress-up scent; she wore Jovan Musk for Women for "everyday," moving through Anais Anais and Coty L'Effleur and Elizabeth Arden 5th Avenue. For years I avoided No. 5 because it was the Smell of My Mother - but it is gorgeous. I love to wear Mariella Burani because it's very similar to No. 5, but just different enough that I don't feel that I'm wearing Mom. I'm not sure about this grandmother thing... The grandmother that lived with us loved lipstick and nail polish and every Avon sample in the book; she regularly wore Avon Cotillion and Blue Grass, neither of which I liked, although it occurs to me that they might have been light- or age-damaged. The smell I associate most with her is that of Nivea lotion, which I also dislike. I miss her very much (she died four years ago, at 92), but not her smell. My aunts wear Lauder scents: Knowing, Beyond Paradise, White Linen. They smell lovely. I still don't know what about the Lauders makes them not work for me (they lead to nausea). And my mother's best friend, elegant and British, wore Cristalle. Which I only figured out after trying Cristalle and exclaiming "Georgina!" quite involuntarily. Hi Mals, this post did touch a nerve! It started with a discussion I had with JoanElaine @ RedolentofSpices on Facebook, because I think she said my mom sounded cool (because of my reference to her in a post discussing her going back to college and what perfume she wore). I began to wonder, did all these perfume lovers I know get "that way" because of their mothers' influence? I've really loved reading the responses and also learning about perfumes I've never heard of, or being reminded of the perfumes I've meant to try and haven't. It's just nice to hear people make a very intimate connection between someone they loved and a perfume. My mum is the reason I have owned over 300 perfumes because she could never commit to one! The only scent memories I associate with her are Jean Nate (regular gifts from dad), 4711 (she would borrow my dad's),Aliage (she adored the vintage,Nivea lotion and Pond's Dry skin cream. She never bought a bottle of perfume in her life because, as a manager of various textile companies in NYC for 50 years, the salesmen/company reps/various employers bequethed her with great fragrances as gifts (Shalimar,Youth Dew, Private Collection,White Shoulders,Bal a Versailles, Chanel 5,19,22, etc,etc,etc). When I was a young girl she shared ALL with me and even gave me the ones she didn't like. The closest one that comes to being a signature fragrance for her is Annick Goutal's Eau d'Hadrien which I introduced her to and then had to buy for her all the time. Nowadays she "inherits" any scent that my allergy prone family/co-worker complain about me wearing. I find that as she has gotten older her love of fine,vintage perfumes has changed and she prefers the now popular fruity-clean-fresh scents. I read somewhere that these scents evoke "youthfulness" which is perhaps why my mother gravitates towards them as she doesn't "want to smell like an old lady"( her words!). breathe31: 300-plus perfumes is quite a collection! I love seeing my favorites among them: Chanel No. 19, Aliage, Shalimar...And lucky you that you got to inherit them and play with them. It's no wonder you've had a collection of your own over the years. And yes, the reason why so many of our mothers switch to light scents makes a lot of sense: to feel younger, fresher, less heavy with the weight of some of these sexier perfumes. My mother loved Shalimar, she wore it since she was married, after WWII at least. I remember my Dad would buy her a new fancy bottle for Christmas or her birthday. She would let me wear "just a little" for a special occasion. I felt so grown up! I still stop and smell Shalimar if I see it in a store, and think of my wonderful Mom. Hi TxGal, Wow, that's such a lovely set of memories surrounding one perfume. Your father, his gift, Christmas, birthday, her gesture to you...It's all about love. Thanks for sharing it, and maybe you should get yourself a little bottle of Shalimar! Barbara, my aunt (mom's sister) wears Gloria Vanderbilt, and it smells terrific on her! My mother wore Shocking until they stopped making it (the real one) in the '70s and then wore Ma Griffe. These are the ones I remember most. She wore others later on: Bill Blass was one, Pavlova another, but I don't remember her for these. Nice, Nancy G. I love both Shocking and Ma Griffe, two vintages that are still easy to find and relatively cheap! Not very original, but yes, mom liked perfume more than the average person (apple doesn't fall far from the tree and all that). Her absolute "bestest" was Cabochard which she adored. She also loved Dioressence, in the days when it was a complex ambergris oriental, not a "diet chypre". Then again there were others: Soir de Paris, Mitsouko, Tendre Poison, my gift of Tuberose Passion to her...several. My mother wore Coriandre in the mid-70's, Oscar de la Renta in the late 70's and into the 80's. Now she wears Femme (I bought her a bottle for her last birthday). I still own a small bottle of vintage Coriandre, and I wear it when I'm feeling nostalgic. To this day, it's the scent that reminds me most of Mom. "My Sin" by Lanvin and "Fath de Fath." My mother was a driven perfumista. She always had a little collection of scents and made a signature out of a number of those fragrances. One of my earliest memories with my mother involves a trip downtown just to buy Miss Balmain at the old Simpson's department store in Toronto. I still remember us stepping off the streetcar and onto a far-less-crowded-than-today Queen Street (in the sense that cars could actually move on that street; they just don't, today). She was holding my hand as I stepped off and she had to help my brother down by lifting him up and carrying him across to the sidewalk, and through the great revolving door, and naturally we were perfectly dressed to match my mom. The store was huge and I don't recall much of the expedition itself, but I do remember the square bottle and the gold, purse-sized atomizer we came home with. She kept and refilled that for many years, until Miss Balmain became difficult to find. She also loved the classics which she bought for herself, and she received a lot of perfume gifts from my father. Chanel No. 5, Shalimar (she had this incredible blue and white metal refillable "shell" that you could purchase large bottle refills for--she kept it for years, until Guerlain stopped selling the refills), Youth Dew and White Linen. I even remember bottles of Sortilege, Tweed by L'entheric, Tabu, Pierre Cardin for women (remember that? ), Ciara, Tea Rose...and bottles of Je Reviens and Blue Grass, Charlie, Diorissimo, Chantilly, Fendi, just so many. But I'm not so sure of the Grandmother Theory--I think about what my grandmothers wore and all I can really remember is a kind of Acqua Colonia that you can find anywhere in Italy--neroli and bergamot and a bit of jasmine. And I never associate scent with my mother's mother, only my father's. Neither seemed to have my mother's desire for it (but then again, my mother was a very skilled cook who knew a lot about plants as sources for aromas, flavours, and medicine, so that must have had something to do with it). Maybe it applied where my mother was concerned: she could have developed her own interest through her grandmother's. Mom had an unusual name, she was named "Palmarosa", after the aromatic plant used for making perfume. I'm almost 100% sure she got that name from her grandmother. Just found and loving this blog. I like you am involved in the hospice care of perfumes. My mother had several on the tray, Emeraude, Muguet, Charlie, are just a few that come to mind. But the stand alone star she wore most often and was my first headswimming love affair was Rive Gauche. I still love and wear it(one of the few reformulations I can live with). 50 roses thank you for mentioning that about grandmothers. Off to find that book because in my case at least I think it's true. While I did fall in love with my mothers Rive Gauche and still like vintage emeraude it's my grandmother whose scent preferences that are almost identical to mine. Her dresser was home to many of my favorites. Mitsouko, Miss Dior,Jicky, Houbigant ChantillyMa Grife even Katherine Denuve. To contradict this my twelve year old daughter said to me the other day while we were discussing perfume(after she told me perfume is like music now. Everyone just accepts the crap they're told is good by everyone else" :proud: there's something in a lot of nice perfumes that's similar with all of them and it's just you. She meant woods I'm sure but I would guess or hope at least one day woodsy scents will be near to her heart. Hi Denise, Glad you're enjoying the blog! Vintage Rive Gauche is gorgeous, and it's interesting you identify more with your grandmother's tastes — although given the roster of perfumes you mention, it might just be because of the era rather than genetics! Do you really think people can accept that perfume's good even if it's "crap?" Music, maybe...but I don't think it works that way with perfume. I could be wrong...Thanks for stopping by! My Mother wore Narcissus, which I have been told was the first perfume made and is still being made in Paris. It is over 200 years old and can still be bought. My Mother started to wear this perfume in the 1930's and she always was telling me about it. I happened to visit a perfume shop in Sydney Australia a few years back and she ordered me in a Bottle from Paris, I only wish I had thought to do this for my Mother in her later years, she passed away in 2008 at the age of 92 years. It is a very soft perfume and I wear it now and again. Tracey October, 2011. Sydney Australia. Hi Nick. Your mother had fantastic taste! I've never tried Talisman; you've now gotten me curious! Wow. . .I have always knows that smells can trigger waves of memories, but i just found out that reading about smells can do the same thing. My "no nonsense" Mom never wore perfume other than the Evening In Paris that my sister and I would chip in to buy at Woolworths on her birthday. I remember that it came in a box lined with blue satin. I had a friend with a very fashionable Mom who wore La Dix. I loved the perfume so much that as soon as I found my first job, I started wearing it. I was much to young (18), but it made me feel very special. Hi Kathleen, I don't know about you, but if I'm reading about a perfume I'm familiar with, I'll conjure it up in my mind. And in the case of my mother's many perfumes, emotional memories of those times when she wore those perfumes will come up too. It's cute that you and your sister saved up and got your mother fancy perfume at Woolworths. I love the Evening in Paris bottles, boxes, and advertising. Thanks for sharing this memory with me. My Mom wore Tabu, Musk oil, and Pheremone. She always smelled fabulous. Even her clothing smelled of her perfume. She always had such glamorous jobs like model and private investigator. She is always well dressed and smells fabulous! I always tried to live up to her perfection, but I never made it. LOL. Even now she looks elegant, and I look ditzy!! Miss Dior when I was little in the 70's, and Kiku. I've not had a chance to sniff Kiku since the 70's so wonder if it would bring back memories. I just remember the bright yellow plastic sphere of talcum powder on her dresser, which appealed to my toddler's instincts! I can't wear Miss Dior because that is definitely my mum's to me. My parents and I lived in France in the early 1960's, and my mother bought boxed perfume samplers that saw her through many years. I remember a Worth perfume that she liked, Arpege and Je Reviens. Smelling vintage Je Reviens now, I'm surprised she liked it so much--it's not her at all. What was her was Shalimar, another favorite from her assortments, and she eventually bought a big bottle of it. After that, she wore Joy for years, until Alzheimer's incapacitated her. After she got sick, I presented her with a bottle of Joy from the duty-free shop, and she looked at me and said, "Honey, I can't wear that! You know I've been allergic to perfume all my life!" I'm sorry to hear about your mother's Alzheimers and her subsequent lack of memory about this fragrant time in her life. I'm glad that you can remember the joy she once got from perfume. Thank you for your post! I, too, wish the samplers would return. After posting my comment, I looked up what they were called: coffrets. You're lucky to have some! My Mother wore "Narcissus" which was one of the first perfumes ever made approx. 150 years ago in Paris. I believe the original shop still exists in Paris and still sells this perfume. My Mother wore this perfume in the 1930's in Australia, I do not know how she purchased it in those days in Australia, but somehow she did. I found a perfume store in Sydney who ordered some of it for me from Paris, and it still smells devine. I can remember the smell of it when she wore it for many years, when I was little, many years ago. Thanks for this wonderful story. Who makes Narcissus? And, if I sent you the proper vials/droppers, would you be able to share? Thanks! My mother bought me a cologne by estee lauder called cotillion when I was 16 in 1974. It was the best perfume I ever had, than estee lauder discontinued it. I have been looking for it and I cant find it online not even in ventage colognes. Hi Lois, Are you should its not Avons Cotillion? Its all over eBay. The perfume encyclopedia doesnt list Cotillion as an Estee Lauder fragrance. My mom wore Arpege . Since i was Young I've loved it and own it myself . I have the bottle of Pino-Nice Anita that my father sent to my mother from Europe during WWII. It has evaporated to about 1/2" in the bottle and the residue aroma is heavenly. I take it out from time to time to feel as if she's in the room with me. Any information on this fragrance? My mum wore and still wear Opium, Poison,Samsara and later on White Diamonds. My mother wore Houbigant's "Quelque Fleur," which means "bunch of flowers." I gave her so many bottles of this for presents over the years! First of all thank you for such a lovely blog! I am addicted to it! I read and re-read everything! Perfume is and always has been a very big part of my life! I have ordered your book and am so looking forward to receiving it! I got my love of perfume from both my mother and grandmother! My mother always wore Shalimar, Emeraude, Opium, Fleurs de Rocaille, and always had a big bottle of Arpege extrait! She now has Alzheimer's and sometimes she mentions Le Dix claiming she wore it on her wedding day. What I wouldn't give for just a decant of this for her, since I cannot afford e-bays prices. Thanks again for your lovely blog. You are an incredible lady! Phillip, So glad you like the blog! And I hope you enjoy the book. You can get a reasonably-priced vintage Le Dix by going online to a decant site such as ThePerfumedCourt.com or SurrenderToChance.com. Good luck! You should definitely get some for your mother to smell! My mother wore--and still does--Shalimar and Bellodgia. They were her mother's favorites. WHen she was a younger woman my mother wore Dana's Platine but when my grandmother died in the 1960s, she left full bottles of Shalimar and Bellodgia which my mother started to wear to remind her of her mother, and has worn them ever since. Now in her eighties, she alternated between the two and always smells like one or the other, sort of a "Shallodgia"--very nice, I think. Shallodgia sounds fabulous. Thank you for sharing that! My mother enjoyed My Sin by Lanvin which was a Christmas gift from my father. I also remembered seeing Arpege on her dresser. She tried others over the years, Wrappings by Clinique was a winter favorite. As she got a bit older, she focused on the one scent she loved the most--Maja. A Spanish classic. An herbaceous unisex fragrance that is absolutely lovely! She perfumes her linen closet with Maja soaps, and it is the one fragrance that always reminds me of her. My Mom loved Tweed when I was young and graduated to Youth Dew in my teens. She also liked Scoundrel in her later tears which I thought was simply awful and Exclamation which wasn't so hot either. Just found this blog. My mother wore so many of the lovely scents everyone else has mentioned. Norelle, Wind Song, Tigress, Charlie, Amazone, Cabotine, MaGriffe, White Linen, Arpege, Madam Rochas, Magie Noir, Red Door, EL Private Collection, Bill Blass, Versace V/E, Climat, Coriandre, Rive Gauche... She has always worn fragrance. Nowadays she loves AE by Clinique. The only grandmother I ever knew ONLY ever wore "Uralt Lavendel" a German lavender scent. It was used for many little ailments so all of her drawers, closets, etc smelled of lavender. I have always loved scent. From my first Tinkerbell perfume to the order for Aramis Calligraphy Rose I placed ten minutes ago. I'm not sure what my quest is exactly, but my Mother helped create my love for beautiful fragrance! do they still make the original formula Evening in Paris ? , I purchased an old partial bottle fro Captains Attic in tx, it was old and horrible,He assured me it smelled very good . If you want Evening in Paris to smell like what youre used to -- but the vintage on eBay. Reformulations, Ive heard, arent good.